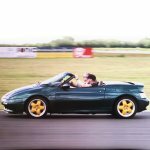 Lotus Elan Central • View topic - Whats your favourite photo of your car? Re: Whats your favourite photo of your car? Does it fit in your garage ok? Dico, I have to say that it does really annoy me on my Elan and seeing other cars where the directional wheel design isn't the same on both sides.<br><br>Nowt I can do about it though.<br><br>I'll try and get some snaps done this w/e. I haven't long been in posession of a decent digicam. Cool pic Michael! Would make a good avatar! ah, the old "front parking/turn indicator lens installed backward" trick . . . It takes 43 muscles to frown and 17 to smile, but it doesn't take any to sit on your arse with a blank look on your face. Click on my WWW link for information on chips and ElanScan. CHRIST drive an elan? ?<br><br>god is his co-pilot? FasteR Magazine: As far as we can tell, Sh4rk's engine will be one of the few things that will be still standing after a nuclear war!